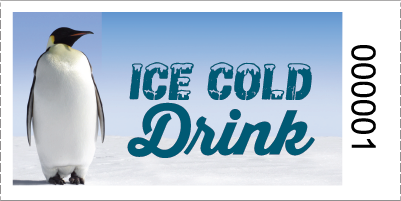 Our Premium Graphic Style Ice Cold Drink Tickets are sure to bring a smile to everyone's face - Is there anyone who can resist a good looking Penguin ? These ICE COLD Drink tickets are a great alternative to pay for drinks at your event, club or restaurant. Each 1" by 2" ticket is printed in bright colors on heavy white paper stock and are sequentially numbered for easy tracking.